Oh, I love dips! With everything. From gooey cheesy fatty ones to healthy cool tomato salsas. I just love them. 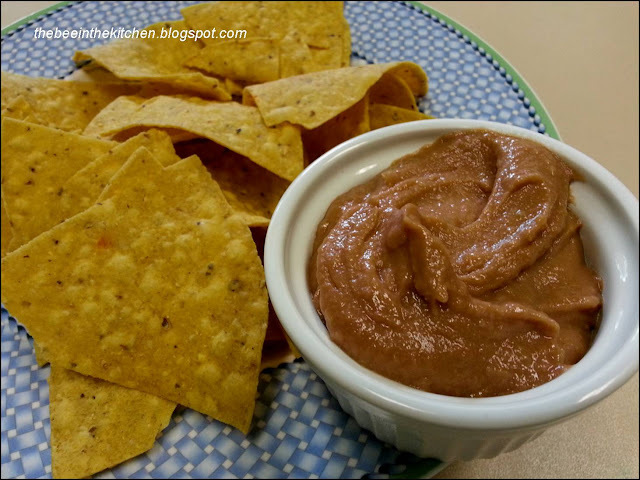 And bean dips aren't exactly new- but they're a big hit every time you serve them in a party! Pile them up to build a nacho tower with ground beef, cheese, guacamole and the works. YUM! It makes a great filling for enchiladas too, and great paired with pita chips. *Tip: it's best to pair this with really good chips. Poor quality chips that are tough (even if they're new) ruins the beauty of the dip =p Personally, I love Tostitos white corn chips which were sadly out of stock when I made this. Mix everything in a food processor until properly blended.